What sharpening stones should I start with? We get asked regularly to recommend stones for the beginning sharpener. Everyone wants to get stones that will be of the most practical use. No one wants to waste money on something they will have to replace later. The goal is to get stones that can be used as a foundation for your future needs. But the number of options available can be bewildering to the inexperienced sharpener, leaving many wondering where to start. The truth is that there is no one recommendation that we can make that will meet everyone’s needs. Every sharpener’s needs are different and every sharpening toolkit will be different. In order to help beginning sharpeners get started with good sharpening stones to build around, we need to understand their individual needs. So with that in mind, let’s look at the basic needs of a beginning sharpener. You will need a coarse stone. Coarse stones are the foundation stones of your sharpening toolkit. Sharpening is based on getting a good shape on an edge and then refining it, and a coarse stone is the fastest way to get a good shape on an edge. You will also need at least one finer stone. Once the shape of an edge is established, successively finer grits are used to refine the edge improving the quality of the cut it delivers. A dull edge will not cut well and should be shaped with a coarse stone. An edge sharpened on a coarse stone will cut better than a dull one, but still won’t be ideal and should be improved with a finer stone. As you progress through finer stones, the cutting edge will continue to improve. How many and how fine these stones need to be varies depending on how fine an edge you require. Now you may wonder, if a finer stone produces a better cutting edge why do I need a coarse stone at all? The answer is that finer stones work much more slowly than coarse ones. The amount of metal a fine stone removes with each pass is much less than what a coarse stone removes. If you have an edge with a good shape to it from a coarse stone, this is not a problem because the fine stone doesn’t have to remove much metal to improve the edge. If the edge is dull, it will take many times longer to reshape it with a fine stone than it would with a coarse one. For further information on grits and edge formation, check out our articles Sharpening Stone Grit Chart and Visualizing an Edge. The type and size of the blade being sharpened determines the size of the stone needed. In general , a 6" stone is considered a small sharpening stone, an 8" stone is a common larger size, and a stone larger than 8" (10"-12" are available) is considered generously sized. Stones smaller than 6" (3" and 4" stones are quite common), are considered pocket stones and can be used for toolboxes, tackle boxes and on-the-go sharpening, but are generally not recommended for regular sharpening jobs. As you probably have guessed, knives are easier to sharpen on longer stones. The width of the stone is less important than the length when sharpening knives. The longer stone allows for longer sharpening strokes and contributes to faster sharpening. The longer strokes mean fewer strokes across your stone, making it easier to maintain a consistent sharpening angle. As a rule of thumb, a small knife can easily be sharpened on a large stone, but a large knife cannot easily be sharpened on a small stone. For woodworking tools like chisels and plane blades, you will need stones that are at least as wide as the blades themselves. Length is helpful but not always critically important. The one exception is when you're using a guide for sharpening tools. The guide often rides on the stone and longer stones permit you to use a much larger portion of the stone as both the guide and the edge need to simultaneously touch the stones. You want sharpening stones that will be useful for the majority of your edges now, and that will remain useful as you expand both your tools and your sharpening toolkit in the future. Ending up with duplicate stones or ones that are no longer useful as you gain new knives or tools is a waste of money. The goal is to start with something that will stay with you as your needs develop. Learning sharpening technique requires focus even without worrying about the stone itself. Stones that require frequent flattening, soaking and cleaning, or that take a long time to create an edge can be a source of frustration to some beginning sharpeners. Keep in mind your willingness perform regular maintenance when choosing a starting set of stones. Everyone has a budget, and there are sharpening stones available for every budget. There is some truth to the “you get what you pay for” adage, but that does not mean that only the most expensive stones will do. Effective sharpening can be achieved at a variety of prices. A good way to think of it is to look for the best you can comfortably afford. This may mean getting just one or two stones at a time and building your set slowly. Or it might be one of our many kits that presents the best value. Based on these factors, we have some recommendations for beginners. Rather than one or two sets that we direct everyone to, we have a few options to consider in order to find what will work best for you. Frequently, our recommendation for beginning sharpeners is to start with diamond stones as their strengths make them ideal to build a sharpening toolkit around. Diamond stones are low maintenance and durable, lasting many years with only occasional cleaning. They are among the fastest stones to use making them time efficient. Diamond grit will handle even very hard steels, and diamond stones can be used for flattening waterstones. All these things make diamond stones a practical foundation for your sharpening toolkit. The DuoSharp Plus stones are nicely sized at 8” long by 2 5/8” wide and have two grits on each stone to maximize value. The Plus in the name refers to an area of continuous grit in the otherwise interrupted grit surface of the stone. This area is for sharpening edges with fine points that might be difficult on the interrupted surface. A coarse/fine DuoSharp Plus stone is a good single stone to start a sharpening toolkit. Combines four grits on two stones and a base in one package at an economical price. These diamond stones are 6" long by 2" and smaller than some stones, but also cost effective with two grits on one stone. The continuous grit surface of the Dia-Sharp stones is good for tools with fine points. For those who don’t need as much surface area, a coarse/fine 6" Double Sided Dia-Sharp stone is a good starter stone. Comes with four grits on two stones and a wooden holder, all for a price less than some larger individual stones. These are very popular stones. 8" Dia-Sharps have a single grit per stone making them more expensive, but at 8" by 3" they are wider than the 8" DuoSharps, offering a good working surface. The 8" Dia-Sharp line also has the widest range of grits available from DMT, with extra extra coarse, medium extra fine and extra extra fine options not available in other sizes, so it is good line to consider. One coarse and one fine stone is a good starting point. Has four grits at a package price offering a savings over purchasing the individual stones. Oil stones have been around a long time, and while not as popular as in the past, they are still a practical option. Not as fast as the other stones, they are easy to use and their lower price makes them a good value for the budget conscious. With oil stones, the relation of the types and grits can be confusing. Our article, Difference in Sharpening Stone Materials, provides a more in depth explanation, but in general an India stone or two combined with an Arkansas stone is a good combination to start with. We offer a series of oilstone packages that combine India and Arkansas stones and are very reasonably priced. At 8" long by 2" wide these stones are not as wide as some other types, but still wide enough for many edges and are plenty wide for knife sharpeners. Available in four price levels, these kits are a great opportunity for the beginning sharpener on a budget. This three stone package is a good place to look if a larger surface area in oilstones is what you’re after. The 11 1/2" long by 2 1/2" wide Coarse Crystolon, Medium India and Soft Arkansas stones provide more work surface than the smaller oil stones giving flexibility to sharpen knives and many other tools as well. The plastic housing retains the oil, keeping the stones bathed and ready to go. The speed and polishing ability of waterstones attract many sharpeners. Waterstones sharpen quickly and are available in fine polishing grits not found in other stone types. The ability to flatten the stones is a necessity when sharpening with waterstones, so a starting set should include a flattening stone of some kind. Our article, How to Flatten a Waterstone, has more information about keeping waterstones flat. A single stone of 120 grit and a combination stone of 1000 and 3000 grits come along with a stone holder all for a price of less than many other individual stones. The stones are 6 7/8" long and 2 1/8" wide. A flattening stone of some kind would be needed, but with economical options available in those, the overall price of this kit would still be low. This entry level set is a good budget minded option. This set of two Norton combination waterstones provides four grits and also includes a flattening stone as an added value. The 220, 1000, 4000 and 8000 grit sides will handle everything from aggressive shaping to final polishing. They are 8" long by 3" wide, big enough to handle most knives and tools easily. Our most popular waterstone kit, this has everything you need to both sharpen with waterstones and maintain the stones themselves. A great starter set. The Sharpening and Specialty lines of waterstones from Naniwa are available in several packages of three to five stones. The Specialty line is the same as the Sharpening line, but half the thickness and therefore less expensive. Both the Sharpening and the Specialty stones are 8 1/4" long by 2 3/4" wide, amply sized for most knives and tools. These are a higher grade stone that do not require soaking before use. While you would need a flattening stone in addition, these kits are a good way to enter into premium grade waterstones. Getting started in sharpening can be overwhelming to many. There are so many options it can be difficult to tell where to begin. Everyone wants to get the best value for their money when starting to build their sharpening toolkit. 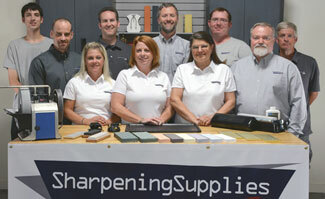 Take heart and know that whatever your needs and budget, there are sharpening stones for you. We hope this information helps to narrow down the possibilities and guides you to a choice you can be comfortable with. And of course, if you still have questions, we are here and happy to help. Have questions about a starter set of stones?